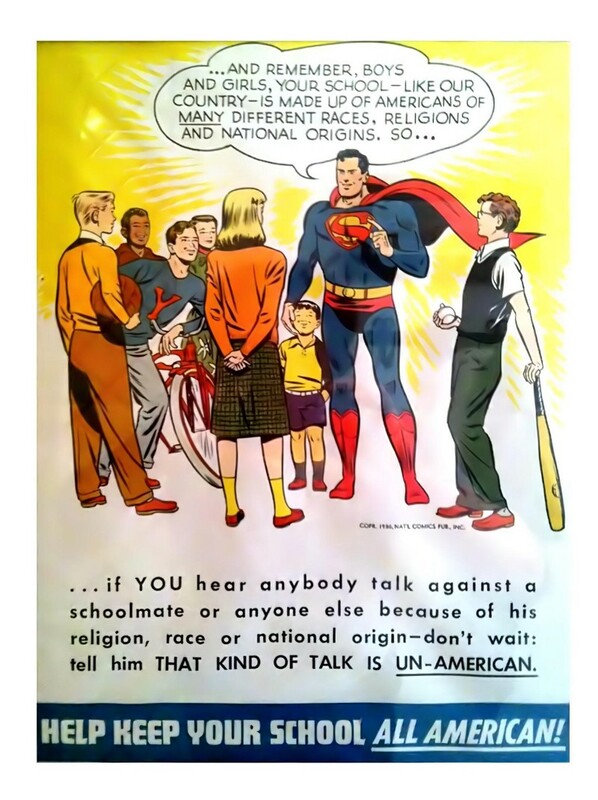 It makes sense that Superman would take a tolerant view of immigrants and other minorities, given that he himself arrived on Earth as a refugee from the planet Krypton. In other words, citizens must steel themselves to take action, because you can’t always count on a superhero to show up and make things right. The cheap paper jacket, above, was distributed to school children by the Institute For American Democracy, an offshoot of the New York-based Anti-Defamation League. Superman could not survive Doomsday, but the Anti-Defamation League, planet Krptyon to the illustration's original distributer, continues to uphold the values he promotes above. Already there have been troubling signs of a spike in hate crimes in the days after the election. As we look ahead, ADL will be vigilant against extremism and relentlessly hold the new administration accountable. You can expect ADL to be unwavering in its commitment to fighting anti-Semitism, racism and bigotry. We will monitor developments and speak out. And wherever and whenever Jews, minority groups, immigrants, and others are marginalized or our civil liberties are threatened, ADL vigorously will defend those rights ... We will not shrink from the fight ahead regardless of where it takes us. In addition to maintaining a database of hate symbols and a form where citizens can report Anti-Semitic, racist, or bigoted encounters, the ADL has a robust list of educational resources for parents, teachers and youth. Meanwhile, a full color version of the 66-year-old illustration has been making the rounds on social media. Let us consider it a placeholder. Eventually someone will surely take it back to the drawing board to add more girls, children with disabilities, and children of color. @Bill W.I think you’re projecting your own views on others. It’s a fallacy to lump everyone into any one group. My parents are immigrants and I’m a minority but raised here and have the experience of both cultures. 100% Korean and 100% American, and I love my country and the ideals it stands for. I say to you, don’t give up hope in America. It will truly be a dark and evil place if good men allow it to be so. Sounds about right, coming from the Man who fought the KKK on the radio…with their own passwords and lore! I agree with your sentiment, but when you work at a San Antonio company where many of your co-workers are Hispanic (some being illegal), and know that a large proportion of them are members of the anti-American La Raza movement…Reconquista!…it shake’s your faith at times. Especially when some of them make it clear they’re only here for $$$, and the free-stuff our government gives them, rather than the desire to be American citizens. Tough call. A crucial punctuation mark is missing! 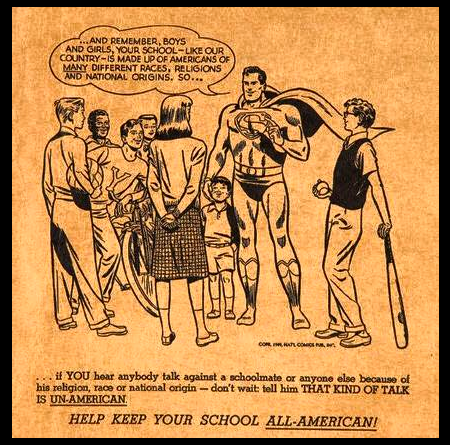 Did anyone else notice that the color version changes it from “All-American” to “all American,” which would be exactly what some people would use to make the opposite point. Sharp eyes, wirthless! I could see how that might play into the supervillains’ hands!